Sadly, as most of you will know, Don Glover passed away last month and I am grateful to Stan Brown, his long standing friend, for sharing some of his memories of Don. “Don worked in the Print business and lived in the same house in South Norwood all his life. I became a close friend of Don, initially through Darts, when we had a great social season with the South London Cyclists’ Darts League. This was extremely popular, with approximately twenty South London Clubs participating and we also played every Sunday when out on the Club Run. Don was a very good player, winning the Cup for the highest score of 180 on numerous occasions and the Old Ports as a team were very successful. Then I played with him in numerous Pub Teams and so our friendship flourished. He was a God parent to my youngest son, who is now forty- six. He bought a Teddy Bear for my eldest son’s first Christmas, he is now fifty- three and the Teddy is still cherished by my grandchildren. As always with generous Don, it was a beautiful Teddy Bear. His only sister, Joy, now lives in Australia with some of her large family and Don missed them very much when they emigrated. She did visit him regularly, Don would never travel to Australia, despite her repeated entreaties, and she was here in England for six months prior to his death. She was a tremendous support for him as he became more ill.
Don joined the Old Portlians Cycling Club around late 1953/ early 1954. We all really noticed him when we went to the Isle of Wight as a Club at Easter 1954 in the days when the ferries were packed with Club cyclists for the Easter activities. He and a friend, Dave Copland, set out later than the rest of us but actually arrived much later! Apparently, Dave’s gear had fallen to bits around Guildford so they both returned home, back to Croydon for repairs and set out once more, some hours later. A very typical Don gesture, one that was a precursor of his life in Cycling. He always went the extra mile – in this case miles- for someone else! The next year on the Easter Tour to IoW, he again came to everyone’s notice in an incident never forgotten to this day. He was sharing a room with Doug Heseltine in a Garden Annex of the Hotel we always used in Ryde. In the morning Doug woke up to find Don’s bed occupied by Rita Ward, an Old Portlians that many people will remember, with Keith Butler and Don sleeping, as best they could, in the armchairs. The story was that they had found themselves locked out of the Hotel as they had been so late in returning, after finding a stray horse on the Bowling Green, which Rita then rode to the Police Station! His cycling was a constant pleasure until latter years, when his Ankylosing Spondylitis gradually became worse, a condition he had suffered with since childhood, although undiagnosed for many years. He was eventually awarded Life Membership of the Old Ports for his services to the Club. He raced spasmodically and I remember riding a ‘50’ on the North Road with him, back in the days when you were obliged to call out your number to the Timekeeper at the finish. Unfortunately his call was missed and he never received a time at all! He never forgot this as he always maintained that it would have been a PB, naturally. He spent all his time with the Old Ports, also going on holidays with them when they went to France. Later, we also rode with the CTC and went on several tours, including Scotland. He loved his cycling and the many friends he made and gave his help so freely. He became an Assistant Timekeeper in 1987 and a Timekeeper in 1989 until he resigned in 2005 as his health deteriorated. He embraced this job with his usual dedication and enthusiasm. Naturally he bought the best Timing Clocks that he could afford, the latest models and was in great demand for his utter reliability and good humour, having a word for every rider on the Start Line. He received the Road Time Trial Council’s Certificate of Honour from the London South for his service to Time Trialling. In addition to his Timekeeping, Don served for a number of years on the Southern Counties Cycling Union Committee and Croydon & District Cycling Association as well as the London South Committee. He Promoted the Croydon & District C A Hardriders Event and continued to do so when it was taken over by the S C C U right up until 2012. Don doing his Tommy Cooper impression! 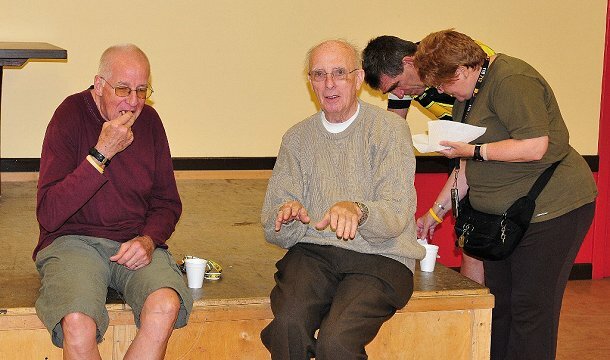 Don was a stalwart in Club Cycling I am forever grateful for the help and advice he gave me in the organization of the Anerley Time Trials. He will be sorely missed. For many years to me Don was just another timekeeper, but that all changed about 10 years ago when I first rode in the Duo Normand 2up. Don was their with a contingent of Old Ports riders. I got to accompany Don in one of the service cars, it was during the following seventy five minuets or so that I found out just how well informed on thing cycling Don was. Once the serious business of the day was over and the teams were relaxing over a rather good evening meal I was to get acquainted with Don’s extensive knowledge of red wines, this seemed to be a feature of most of my subsequent social meetings with Don. If help or support for an event was required, be it early morning or of an evening many a time it would be Don on the phone with an offer of help especially if it was a CDCA or SCCU event. sorry to hear this,don was always a friendly face at time trials,and will be greatly misted i’m sure always remember don sitting with watch in hand,while jon smith would push you off during saturday club 10s,happy days.